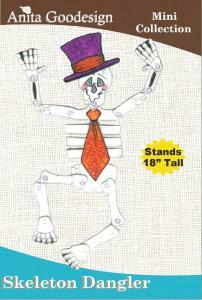 The Skeleton Dangler is a "bare bones" collection that is a favorite among the Anita Goodesign staff. He looks dashing in his top hat & tie, ready for a night of spooky fun. All the pieces of the skeleton will fit in a 5"x7" hoop & the finished skeleton will be well over a foot tall. All Dangler collections include a special tutorial that will show you how to make your very own Dangler.